You can add website bookmarks which can be viewed from each project or opportunity.Team members who have access to the Project/Opportunity can store and access all important or useful bookmarks here. They may be essential to the project or opportunity or simply useful towards their completion. 1. From the side navigation click on CRM and then on PROJECTS or OPPORTUNITIES. 2. Click on a Project or Opportunity name. 3. Click on BOOKMARKS (bottom right). 4. Type in a BOOKMARK NAME. This is what will appear in the list of bookmarks. 5. Type in or paste the BOOKMARK URL. 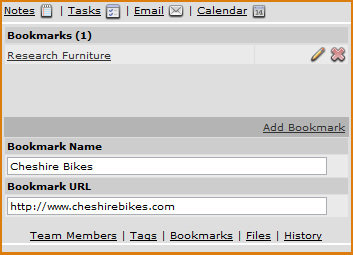 You can now click on the bookmark name to open the url in a new window or tab.